Already home to DC hero “The Arrow,” having a series based on “The Flash” in the works, and mulling over a “Wonder Woman” prequel series called “Amazon,” The Hollywood Reporter is revealing that the CW network is looking to add another DC character, Hourman, to their line-up. “Hourman” (aka Rex Tyler) has all the key elements to make for a decent primetime drama. Hourman centers on a brilliant-yet-troubled pharmaceutical analyst who discovers that the visions that have plagued him since childhood are actually glimpses of tragic events occurring one hour in the future. Determined to win back his ex-wife and son, he heroically prevents these tragedies from unfolding, finding both purpose and redemption along the way. 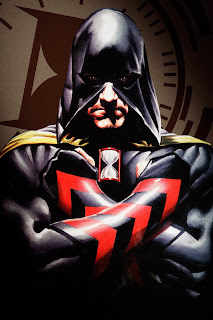 Hourman has been associated with several important DC groups, including the Justice Society of America, Freedom Fighters, the Justice League and All-Star Squadron and has appeared in three different DC series. The television drama series is set to be penned by as well as executive produced by Michael Caleo. Dan Lin and Jennifer Gwartz will also be executive producers. No air date is currently scheduled.